For a child to engage in learning opportunities they need to receive a healthy, balanced meal as this will ensure that their energy levels remain constant and that the nutritional demands of their growth are met. We believe that it is important to buy local, organic and sustainably sourced ingredients so that we can offer a nutritious and varied diet while reducing food miles and supporting local, sustainably minded producers. Many children embrace the challenge of trying ‘new’ foods, however others find this difficult. What children eat and drink during their early years can have a long-term impact on their health. 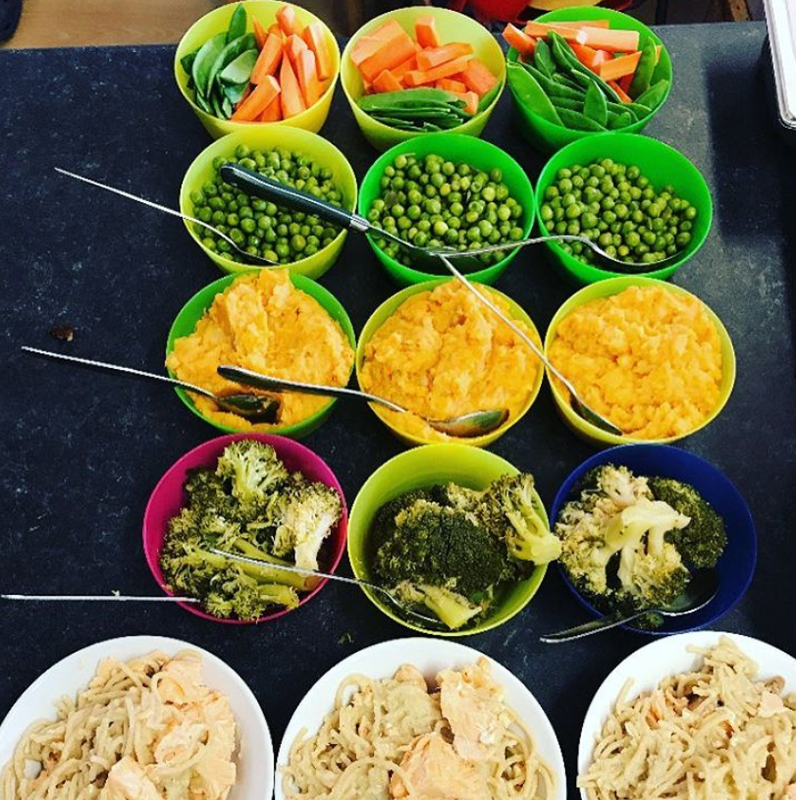 General eating habits are formed in the first few years of life, so at Free Rangers we help children form a positive attitude to food by encouraging healthy eating through positivity and free choice. According to the British Dietetic Association paediatric group, new tastes or textures need to be offered sixteen or seventeen times before your child will take them. We might think of eating primarily from a biological perspective, but research has shown that our eating habits are significantly influenced by our perception of food, as well as various other social and environmental stimuli. At Free Rangers, children are encouraged to look at, handle, smell, kiss, lick, mix, nibble, talk about shape, colour, texture and embrace different tastes. Foods are fantastic! Rather than classifying unhealthy items such as cakes or biscuits as a treat, we should change our perspective – any type of food can be a treat! Sweet strawberries, sour gooseberries, crunchy sugar snap peas. If we encourage children to realise that fruit and veg are fun and tasty to eat, we will help them form a good relationship with food in their early years and beyond. 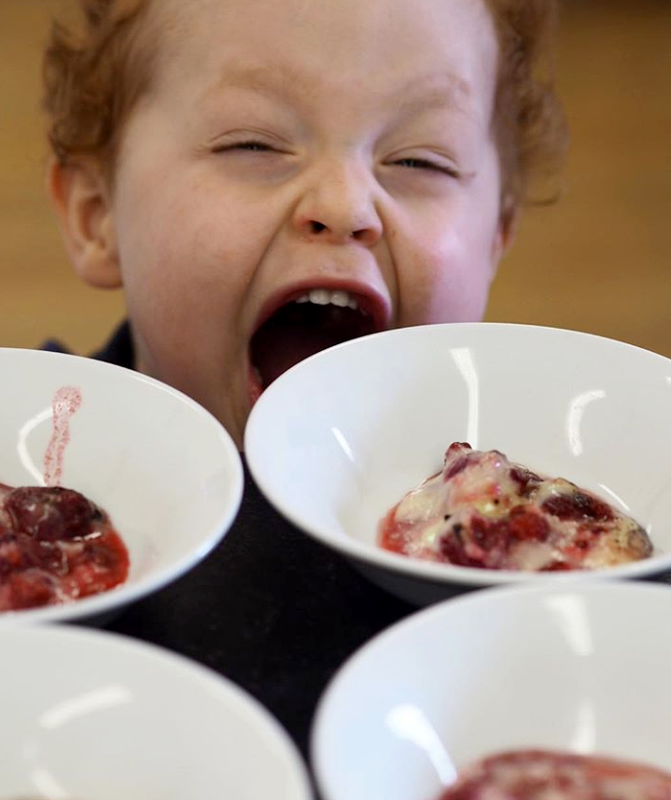 We like to give children a free choice to self-serve their meals because, when you allow them to control their portion size and which foods they have on their plate, it has a positive effect on their choices and attitude to trying foods. It’s alright to not like some foods - children are encouraged to explain what it is about the food that they do not like, the taste, how it feels, what it looks like, etc. Sometimes a child will think that they don’t like a meal when actually they are feeling full. This is why helping children to understand the effect of food on their bodies is important too. We need to help them learn what it is to feel full or hungry and what different foods do for our body. It has been reported that many children have lost the connection to food and where it comes from. In this busy, modern world of ours it’s easy to forget that growing fruit and veg gives us a positive connection with food. At Free Rangers we aim to get that connection back by offering children gardening activities. When we grow food on site the children can watch the changes fruit and vegetables go through before they are harvested and used in our meals. Our children also help our chef Jayne to pick, wash, prepare and cook with the foods that we grow on site and some that we have foraged from the hedgerow. These shared experiences provide a positive social and mental attitude to diet. Two of my fondest childhood memories are sitting with my gran on the doorstep to her house, shelling peas and watching my mum in wonder as she peeled an apple in one, leaving the peel in a spiral. Do not underestimate the importance and effect of simple shared experiences on the psyche, on the mental processes behind how and why we eat. Our children have shared experiences peeling boiled eggs, shelling peas, washing and chopping vegetables - it doesn’t have to be complicated. The most recent cookery group have helped Jayne to make a pumpkin cake which will be on this week’s menu. They were invited to scoop the pumpkin flesh which is a tactile, sensory experience and add it to the cake mixture. Looking at what is happening, smelling and touching the foods, watching the effect of the mixer. Putting it into the baking trays and seeing it cook and rise in the oven and smelling the freshly baked aroma. There are children that will need further support when establishing their relationship with food. There can be many reasons why mealtimes cause anxiety, so it’s important to explore which areas of the eating experience are triggering a child’s anxiety. A process of elimination can be put into place, being patient, working to desensitise a child to new foods in a non-controlling way and possibly altering the eating environment. Have patience and be reassured that you are not the only family to have experienced mealtime issues. If you have concerns please ask for guidance from your health visitor, doctor or nursery.